FA Cup second round glory live on terrestrial television awaits for one of Solihull Moors FC and the Seasiders tonight. Much is sure to be made of the fact that the visitors were famously FA Cup winners in 1953. It will probably also be remarked that Blackpool was a Premier League outfit as recently as 2011 while Solihull Moors has worked its way up the non-league pyramid. Solihull Moors even had more home fans at their last game at Damson Park than turned up for our last home game against Burton Albion. What might not get quite so much attention is the curious disparity in the training facilities of the opposing clubs. Solihull Moors developed an all-weather training facility in conjunction with neighbouring Boldmere St Michael’s FC, back in 2016. Their development is a state-of-the-art facility, used by their first team and all five teams from their youth academy – set to rise to eight next year. Blackpool, on the other hand, have a joke of a training ground at Squires Gate whose facilities are so dire that it has been unusable for months, as a result of which the first team has been training for most of the season out of town. 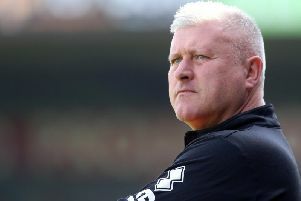 Quite how unsatisfactory the current arrangements are was highlighted to Terry McPhillips and the players when they were able to train at Barnet FC’s set-up prior to the game at Southend. Locally, AFC Fylde has projected a two-year return on the cost of building their training centre, after which they would be in profit, while the facilities at Fleetwood Town FC’s Poolfoot Farm training ground are quite superb, possibly the best outside of the Premier League. Poolfoot not only provides the Cods with somewhere to train but also benefits the local community as well while still making a healthy return on investment. It is quite astonishing that the Fylde Coast football club which won the football jackpot back in 2010 and has had countless millions of pounds flooding into its coffers is the club which has no fit for purpose training facility. Eventually, when regime change happens and new owners come into Blackpool, maybe the club will secure the decent training facilities it has repeatedly been promised for the last 20 years. If a new training ground could be located closer to the football club and perhaps developed in partnership with local institutions such as the council so that it would also serve and benefit the community of Blackpool, then that would truly be a progressive move to a brighter future. Perhaps if Owen Oyston had been willing to invest just a tiny fraction of the money earned for the club by Ian Holloway and his team then McPhillips wouldn’t have to be considering doing some work on Squires Gate himself so that his team would have somewhere local to train. Maybe Gary Bowyer wouldn’t have needed to source an alternative venue at Fulwood and pay for it out of his own pocket. Maybe Blackpool fans would be supporting their team in person in their thousands rather than continuing the long-running campaign to show the rest of the world exactly why we need to boycott our own club. For those fans boycotting Blackpool FC games which bring any financial gain to the Oystons, cup matches have always been ‘off limits’ as gate receipts are shared between the two participating clubs. There will be few Blackpool fans at Damson Park tonight but Solihull Moors will receive substantial revenues from the game being televised live. It will also give thousands of boycotting Blackpool fans a chance to watch their team in NAPM- compliant mode. The owners and directors of Blackpool FC are obviously keen to present a picture of all being well, of business as usual. We hope the message gets out there tonight that nothing is normal at Blackpool FC and cannot be as long as the Oystons are in charge.